Professor (grinning): Yea. I get to uncover the history of the General Fatigue and Leg Fatigue symptom clusters. Student: But I was really hurting during the weekend runs. My legs are heavy as lead and sore deep down to the bones. Why? Professor: An excellent question about symptoms. Please check out this website’s page: What’s happening? The page discusses the differences between “Symptoms” and “Signs”. Symptoms serve as signals in an early warning prevention system. They are signals used for self-biofeedback, so one will not ‘go out’ too fast and ‘hit the wall’. Student: How did you get started on all this? Professor: I was very curious and sometimes in the right place at the right time. Student: Also weren’t you a national class marathon runner? I was curious about how my brother, Karl, and I could run faster than 2 hours, 30 minutes for a marathon. Also, in 1968, I was assigned as an Army Physiologist to the Medical Research and Nutrition Laboratory in Denver. In the same lab, Bob Kinsman and staff had just created the High Altitude Symptom Questionnaire. Bob helped me and others do the same for the symptoms of prolonged exercise. Student: A cookie cutter approach, huh?! A key presumption is that all athletes use a form of private speech (or “self-talk”). Their processing of a self-dialog of questions and answers will occur throughout an event; be it a training session, time trial, or, a race. Many athletes have experienced that this on-going dialogue allowed a sense of control within unpredictable unfolding of the event itself. A self-administered questionnaire can be built based on self-talk. Each individual item will be based upon an answer to the question, “At end of a long event, what are you aware of? Physically. Mentally. Emotionally. Socially. *Items 1 to 41 inclusive were retained for the Modified Adjective List (From Kinsman et al., 1973). Professor: We were very pleasantly amazed at which symptoms did group tightly together. And even more so astounding was how the clusters were interrelated. 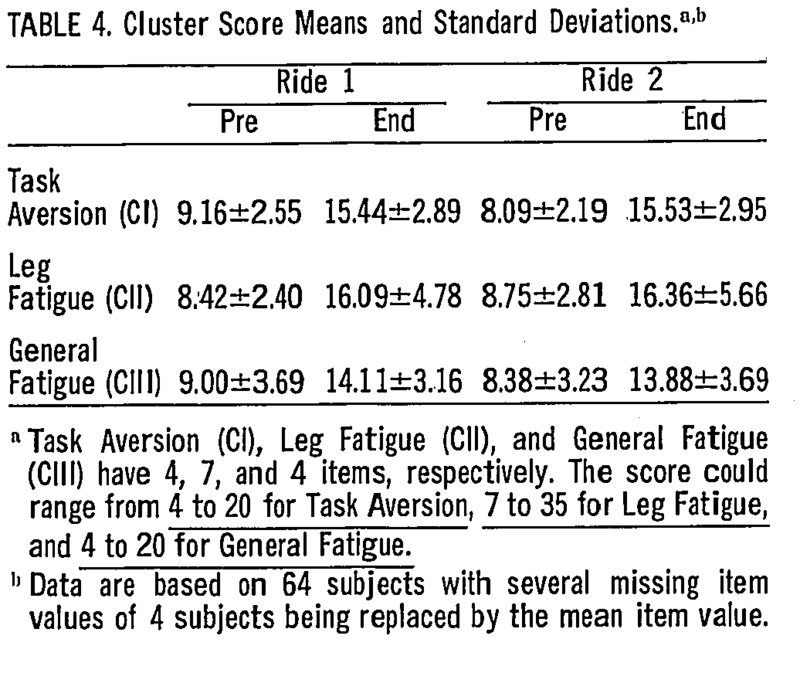 Just look at how far apart are General Fatigue, Leg Fatigue, and Task Aversion (the Motivation cluster was not pictured on this sphere); yet the Cardiopulmonary cluster was oriented neat but separate from the Leg Fatigue symptoms. For more details on cluster internal consistencies etc., download the first published article: Kinsman etal Multidimensional analysis of symptomatology 1973. 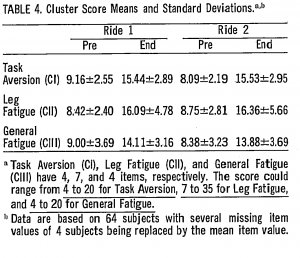 For information on separating Leg Fatigue and General Fatigue symptoms, download the second published article: Weiser etal Task-specific symptomatology prolonged cycling 1973. Student: And did the participants’ reports actually show much of a change? General Fatigue went from 27.4% range at Pre to 86.8% range at End. 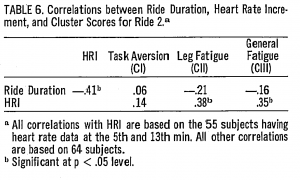 Professor: This was very important Ride duration was negatively correlated with HRI. 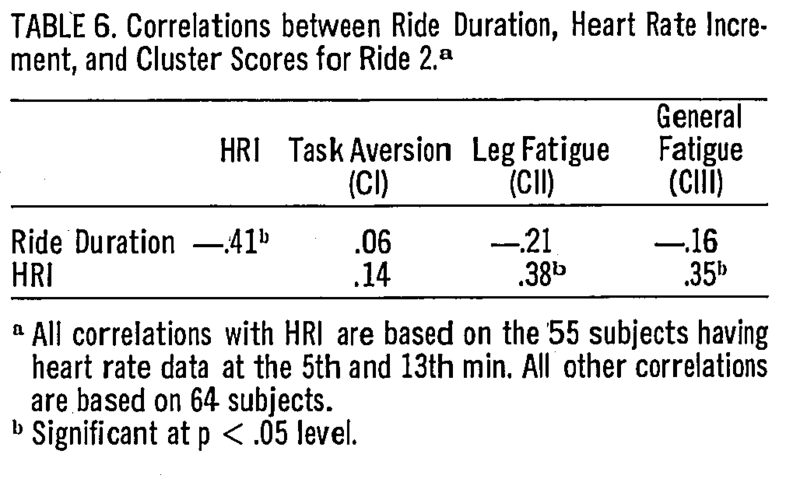 That is, participants with a longer ride time tended to incur a smaller HRI early in the ride than those with a ride of shorter duration. Also there were positive associations of HRI and the score for Leg Fatigue and for General Fatigue. Could these associations be hints at the mechanism(s) for fatigue during prolonged exercise, I wonder!? Student: In our heads, then, these hurts, pains, and other discomforts aren’t haphazard. Professor: Yes, they are not haphazard. Instead they may be very informative. Take Home Message: Aches and pains form clusters in our feelings and may well be linked to the mechanism(s) limiting prolonged exercise. Next: An organizational schema is presented that combines subjective symptoms, the physiogical substrata, and the relationship between physiological factors and symptomatology during work. This study was repeated while collecting cardiopulmonary and electromyographic measures. The next post will review the schema and this newer study, then reflect on later published world-wide research. Kinsman RA, Weiser PC, Stamper DA. (1973) Multidimensional analysis of subjective symptomatology during prolonged strenuous exercise. Ergonomics l6: 221-226. Kress JL, Statler T. (2007) A naturalistic investigation of former Olympic cyclists’ cognitive strategies for coping with exertion pain during performance. J Sports Behavior 30: 428-452. Weiser PC, Kinsman RA. Stamper DA. 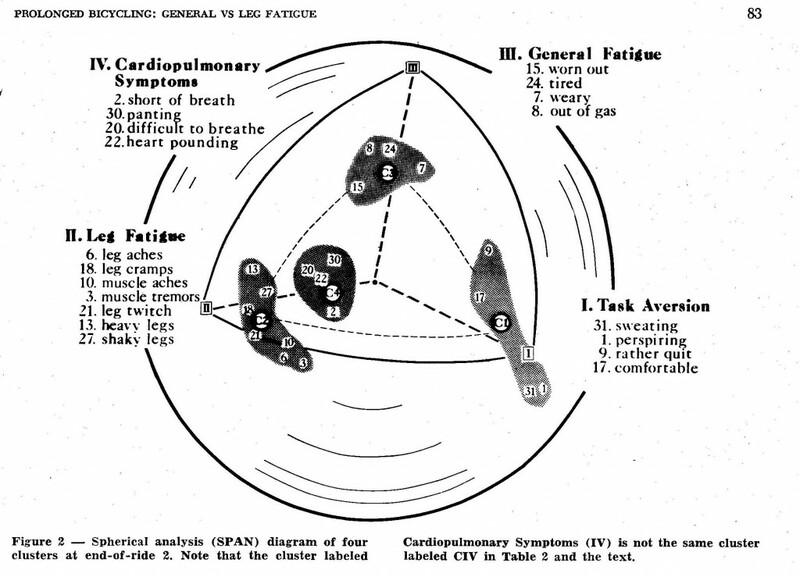 (1973) Task-specific symptomatology changes resulting from prolonged submaximal bicycle riding. Med Sci Sports 5: 79-85.